Several times a year we take our grandchildren down to Hershey to enjoy the local attractions and make a day of it. When we're down for a visit we always stop into Hershey's Chocolate World. 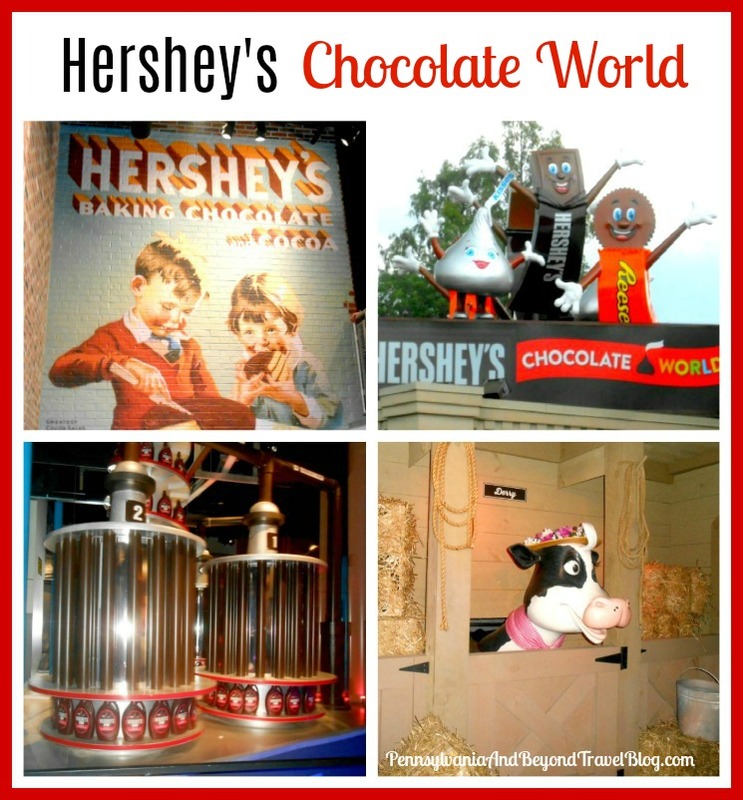 It's one of the best FREE activities to enjoy while visiting the Hershey area. When I say "FREE" you get free admission into the building and the tour itself is free. With that said, there are many PAID activities that you can participate in too. During the months of May through the end of September they can get extremely crowded with tourists. If you want to avoid the crowds and long lines, I recommend that you visit during the off-season or go early in the morning on a weekday. Summertime evenings and weekends are busy, so try to avoid those particular times. Once inside you can walk around and visit all of the various gift shops and souvenir stores. 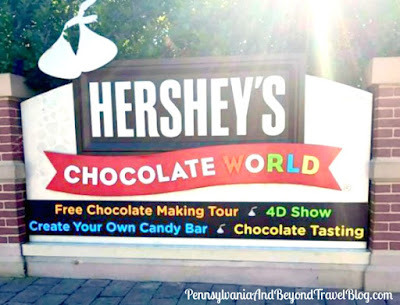 There are a few eateries if you want to get something to eat and if you're looking to buy FRESH Hershey's chocolates and candies, you'll find them here! When it comes to souvenirs & gifts, you'll find t-shirts, hats, clothing, home goods, jewelry, toys for the kids and more. You'll want to head upstairs if you plan on taking the free ride and tour. My grandchildren LOVE getting on the ride and taking the animated tour. Typically we'll stand in line about 15-20 minutes and the ride (tour) lasts approximately 8-10 minutes in length. After you exit the tour area one of the employees will hand you a little miniature Hershey's candy bar for free. When we visit we like to go into the food court area and treat ourselves to one of their delicious Hershey's Milkshakes. Oh my gosh, if you've never tried one...you're really missing out! If you're not a milkshake person, you can try one of their decadent ice cream sundaes which are delicious too! Just want to let you know ahead of time, things can get expensive when eating in the food court, especially if you have a large family. You may want to plan ahead. We love Hershey's chocolate candies so I always stock up when we're down. I will buy several bags of their Hershey's Kisses, Miniatures, Reese's Peanut Butter Cups, baking chocolate, etc. Here's a little tip for you...their chocolates freeze well once you get home! If you're looking for an extensive review on visiting Hershey's Chocolate World in Hershey, Pennsylvania you can check out our previous review post for that. When it comes to parking, you may have to park several rows away from the building if you're visiting during the prime time hours and days. If you're handicap, they do have designated parking areas where you can park closer to the entrance of the building. Most importantly...just go and have a good time!